Welcome to another VOCALOID Tutorial! It have been a pretty long time since I made one, but I’ll continue with the VOCALOID editor tutorials! 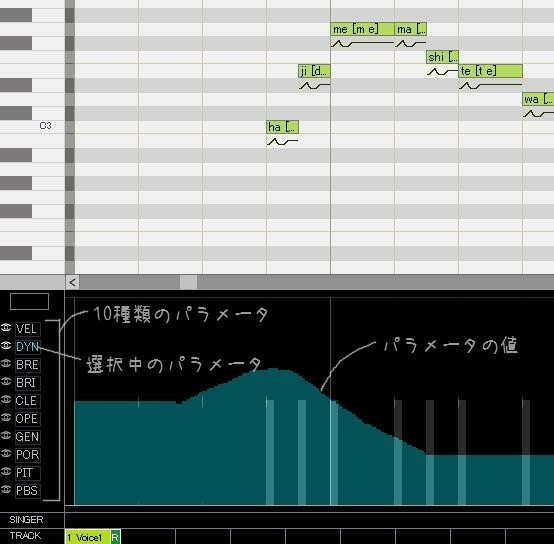 In this tutorial, I’ll explain the parameters on the bottom of the VOCALOID editor screen. The VOCALOID Editor has 10 types of parameters included with it, with each parameter playing different roles. Read on for the explanation of them. The VOCALOID editor engine has many devices for creating more natural singing. On the other hand, in order for a complex and delicate structure, even when the connection of words before and after have the same musical scale and interval, their sounds can still be different. When the people using step insertion without any adjustments listen to the results, they’ve probably experienced a feeling of “what the heck…”. In order to bring the unnatural portions closer to a more natural singing voice, parameter adjustments are important. Furthermore, in order to remove small nuances from smaller compositions, we will also conduct some parameter adjustments. The latter important adjustment is your imagination. If you do not have a complete picture in your head of what the completed work will be like, you can’t make the necessary adjustments. Practice imagining the singer singing while making your adjustments is the basic principle of parameter adjustment (thinking about matching the singer’s voice with the melody and singing range is very important in achieving natural singing). If you’re unable to produce an image, trying to sing the phrase yourself, or getting someone to sing it for you in order to compensate for imaginative power is something good to try. Out of the VOCALOID adjustments, we will primarily look at the adjustments of parameters, facial expressions and vibrato. In order to smoothly understand what’s best to for making your singing closest to what you imagine, it’s important to grasp these three adjustable values. These are the parameters which you could change on the VOCALOID editor. Adjust the length of consonants. Large adjustments doesn’t do much, so usually people doesn’t adjust this value very much. Adjustment of the volume. This is probably the most important parameter out of all of them. Control of the weight of the voice’s breathing. Will considerably effect various nuances. Volume will also be adjusted. Adjusts the “brightness” of the voice. This also adjusts volume. Sharpen the voice. This parameter can make quite an impression, so don’t adjust it too much. Reproduce the variation of pronunciation through adjustments of the opening of the mouth. This will also change volume. Adjusts the voice to a more male or female feel. Works to not break the original foundation of the voice. Adjustments the pitch. Required for the removal of certain nuances. Adjusts the width of the pitch bend. Use this a lot to match the pitch bend. Whenever you adjust a parameter, side effects causing the direction of the sound to diverge away from your intention can occur. Changing BRE, BRI and OPE will also increase the volume. If this is not your intention, it will be necessary to compensate for the volume through DYN, and other measures. Also, it’s considered taboo to change parameters values a noticeable amount while pronunciation occurs. For example, if you suddenly change the PIT from 0 to 5000 in the middle of pronunciation, it will turn into a very unnatural state at the moment you changed the value. The same goes for other parameters as well. Do not make discreet changes to them while pronunciation is occurring. But there are times when discretely changing the value on purpose can lead to interesting results. So it’s really important to change the VOCALOID Parameters properly in order to make your VOCALOID sound more human! Thanks for reading this tutorial, if you have any questions, feel free to post in the comments below! Please go to the link above to view sample MP3 files and more information about the VOCALOID editor, as well as some more tutorials on it (I’ll try to translate them in the future). A new vocaloid book is going to be published by Yamaha Music Media, one of Yamaha’s subsidiaries. Amazon.jp says the shipping date is Sep. 27. I have no idea how to control the parameters except VEL. I tried dragging, clicking, and etc. Could you tell me how to change them? I want to thank you for this. I’m now able to get my vocaloid to sound more human but I was wondering if you knew any good sites that would help me understand scales/notes. I’m having problems figuring out which key I should put my words in to get my vocaloid to sing a higher or lower note. thanks a lot!! now i understand! !